I Say Be Lazy…You Say Tabata | Jen-spiring! Awhile back, I had expressed an interest in getting into shape. I have great intentions. I know I should exercise. I know I need to excercise. I just HATE to exercise. I don’t really get that workout high. I hate to sweat or get dirty. And, of course, I always claim to not have time. However, my sister, the workout-loving gal that she is, likes to encourage me. 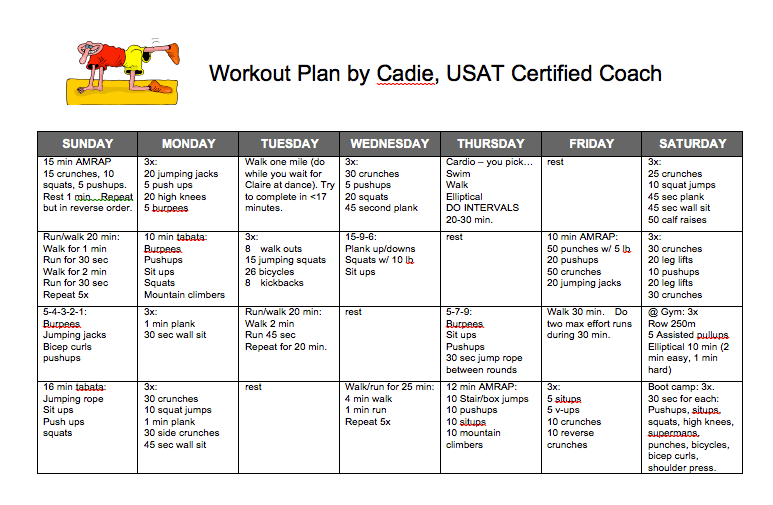 Actually, she is an USAT Certified Coach, so she does know a thing or two about working out. So finally, after the text, I tried a tabata. A tabata workout consists of exercising intensely in intervals with 20 seconds of exercise followed by 10 seconds of rest for a period of 4 minutes. I was doubtful too. My sister kept telling me to try this. She suggested to do three tabatas for a twelve minute workout. She kept telling me I had twelve minutes, so I finally caved in and tried it. I didn’t think that twelve minutes would do anything. She led me through a series of push ups [the worst], squats, and crunches. While the push ups practically killed me, and the other exercises burned at the time, I didn’t think much of it at the time. I didn’t really break a sweat. However, for the next two days, I could feel the results of the workout. My leg muscles, are definitely sore, even the ever difficult inner thigh. I think I will do the tabata method more often. In fact, I am going to commit to actually trying all of my sister’s suggestions. I am going to post her workout for me, so let me know if you try it too. Also, if you are interested for your own workout, you can contact me and I’ll put you in touch with my sister.